Dashboard > Help Center > For Manufacturers: Can I copy data between product records? Go to the product record whose data you wish to copy, and click the button on the righthand side to "Copy Data to Another Record." From this form, you have the option to copy data to an existing record, or to copy to a new record. If copying to a new record, you will be prompted to type in the name of the new product. If copying to an existing record, you will be able to select the record from a dropdown menu of other products in your product list. Select which data entry sections you wish to copy. All sections are selected by default. Please note that when copying data to an existing record, any data previously entered in the sections selected will be overwritten. Sections not selected will be left unedited. Certifications and Compliance - Often the same certification documentation applies to multiple products, so this allows the documentation to be kept up-to-date in one place. Content Inventory (Nested Materials) - If the Content Inventory uses a Nested Material Inventory method, the substance composition of a nested material will be shared in between product records. This allows for ease of updating if the same material component is used in multiple products. Technical Data and Links - As with certifications, some product literature may apply to multiple products. Extraction, Manufacturing and Assembly Locations - Often the same location is used to manufacture multiple products, so this allows for this information to be edited in one place. 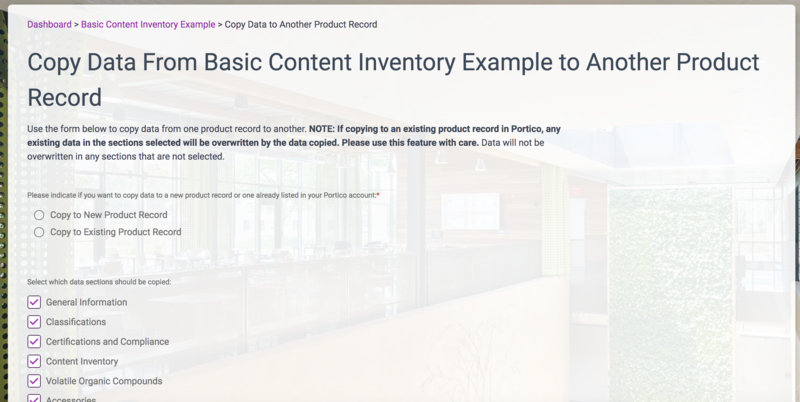 For each of the above entities, you will be warned when editing that other product records will be affected as well, and you will have the option to unlink them to create a fresh starting copy of a certification, material, data source, or location.